In a large skillet, heat the olive oil. Sauté the onions and garlic on medium-high heat 5 minutes. Add the ground pork and sauté a few minutes. Sprinkle in the seasonings. Stir well and sauté until pork is no longer pink. Pour in the fresh orange juice and the orange zest. Pour in the chicken stock. Bring to a boil; reduce heat and simmer, covered, on medium-low for at least 10 minutes to combine all those wonderful flavors and tenderize the pork. The longer you cook it the more the flavors will intensify and the pork will become even more tender. I typically simmer the pork for 30 minutes. In the meantime, prep the toppings: quarter the limes, de-stalk the cilantro and heat the tortillas. 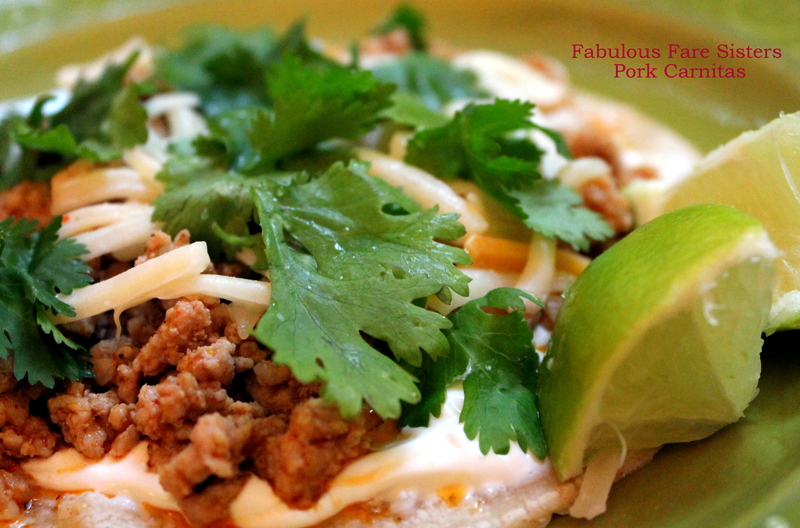 To assemble: Layer corn tortillas with sour cream, seasoned pork meat, Mexican cheese, cilantro & a squeeze of fresh lime. 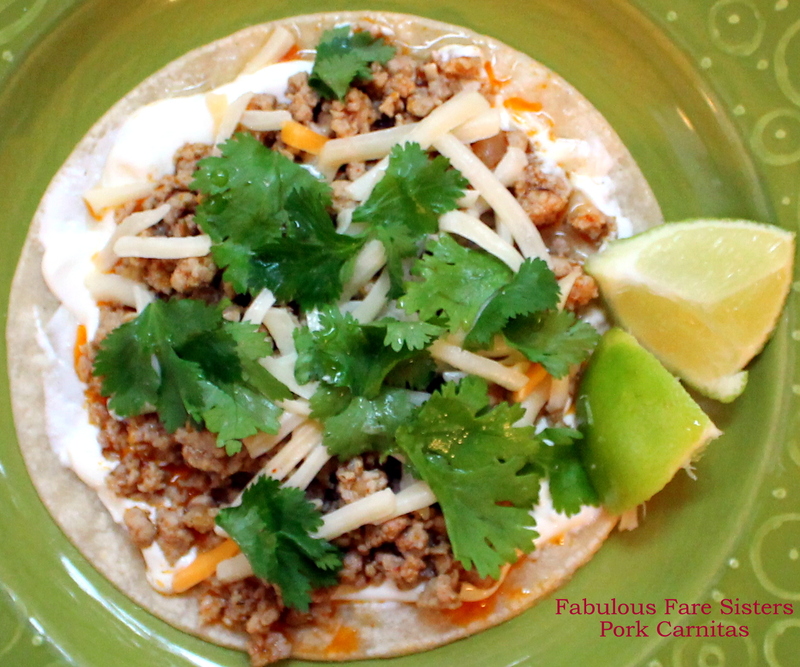 Enjoy these tasty Pork Carnitas that are simple yet delicious! Always Fabulous Fare From Sisters Linda & Heidi! Pork Carnitas to Please the Palate! Oh how I wish these were on my table right now! Looks so good, love Taco Tuesday! This looks so delicious! Hope you have a great Thanksgiving! This looks so fresh and delicious! Adding this to the long list of goodies I need to try thanks to your great blog! I am gutted I’ve already had dinner! (Darn British time!) Next Tuesday I’m giving these a go for sure, they look delicious! Taco Tuesday is great . Great recipe as usual Linda. What are you going to cook for Thanksgiving and what are you doing? Nosy me right? Not at all! I’d love to share what I’m making that day! We’ll be staying home for the holiday with a small group so I think I’m making too much – but everyone loves leftovers! Have a wonderful week Mojisola! These look sooooo good!! I need to switch up my taco nights- my mom usually just uses left over meat that my dad grills on Sundays… This pork looks so good though!